Bands like to make movies, or at least their management like them to make movies, be they the Beatles in A Hard Day's Night, Slade in Flame, or Pink Floyd The Wall, the attraction for putting images to sounds is irresistible, even more so since the music video surged in popularity, first on television and then on the internet. 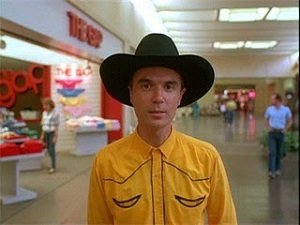 Stepping into that world was David Byrne, who directed videos for his band Talking Heads that were at least as effective as anything emerging from Britain, where the real talent for video creation was focused, and in 1986 he crafted an entire eighty-nine-minute film to accompany their latest album, True Stories. Byrne had attended art school before turning to music, and though he had dropped out his way with visuals revealed a mind that was very much considering what a song would look like in the heads of the listeners. 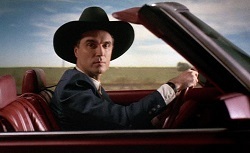 Jonathan Demme directed the first Talking Heads film Stop Making Sense in 1984, some nine years after the band had been formed, and it was widely acclaimed as about as good as a concert documentary was possible to be, indeed it remains a benchmark for the presentation of live music on film. Yet Byrne didn't want to make another concert movie, he wanted to helm something with more of a narrative, and the True Stories motion picture was the result. That said, it is more a series of narratives, inspired by the tabloid news stories that graced the shelves of supermarkets across Texas, yet it was also a tribute to that state and its people, in fact anywhere in the United States where the ordinary folk were. This was down to Byrne divining something extraordinary in the ordinary, not merely some transcendence in the jus' plain folks who populated the places in between the major cities, but an acknowledgement that these supposedly everyday, prosaic people were actually pretty weird if you took a look at them from the correct angle. Assembling a collection of images that fed into that, Byrne built his movie. There is a lot of charm to True Stories, but one issue may be that the sort of person it depicts may not necessarily be the sort of person who understood and enjoyed the film. The impression is that, should you have shown this to one of the characters if they were real, they would not appreciate being presented as a kind of weirdo, whereas the metropolitan audiences would have lapped up the confirmation of their suspicions that Middle Americans were eccentric at best, downright strange at worst; it flattered the view that those most addicted to conformity, to the so-called "normal" life, were actually slaves to a lifestyle they had been duped to believe would make them happy. 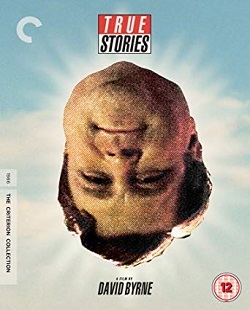 So if all that was bubbling under the bright, sunny stylings of True Stories, was it possible to enjoy unironically, or did you have to bring baggage along to appreciate it properly? Although there would always be the nagging feeling Byrne was staging a major wind-up, if you heard him speak about this project he was entirely sincere about his respect for everything it showed, so it could well have been the inhabitants of Virgil, Texas were how he saw the world, even though there was an undercurrent of unease about their petty prejudices and yearning for contentment they would stop at nothing to attain, summed up in the scenes where lonely bachelor John Goodman seeks love. Goodman was a highlight, perfectly pitching his character's neediness in his genuine bafflement that he cannot find a wife to share his existence with, unaware that desperation, and the sadness born of it, is not exactly the most attractive trait to be conveying on a date, never mind his television advertisement selling himself as an ideal husband without going into what you might have thought were important details. Byrne was obviously very happy with his performance and gave him the last song to sing at the concert finale where his ordinariness is espoused at the expense of anything approaching the egalitarian or socially progressive, another subtle dig. The concept of a parade was vital to the structure of the work, to the extent that actual parades were featured, be that literally - majorettes, lawnmower pushers, babies in pushchairs and ageing men in tiny, red cars stream by the cheering crowds - or figuratively - the selection of clips from television that Swoosie Kurtz, as the laziest woman who never gets out of bed - flicks through on her set, which feeds into a proper video for a Talking Heads tune, featuring the whole band in their only appearance in the whole movie. But that attraction of sitting back and allowing yourself to be entertained by the line of participants was integral to the appeal of this. There were other instances: there's a karaoke scene early on where various townsfolk of Virgil mime to the band's Wild Wild Life as their fellow citizens applaud and whoop, or the fashion show that starts out with mundane grey suits and graduates to models dressed in grass or as architectural features, then finally tiered wedding cake, which you could just about imagine one of these locals dressing up in for a night out. The feeling of watching a television broadcast, say MTV or a variety show, was inherent to Byrne's view of True Stories, and that was a big part of his technique, as if he was taking to assembling a film as a series of linked videos. With himself doing the linking. Byrne's videos really gained traction when MTV were seeking content and put them onto their schedule. Probably the first to make an impact was for Once in a Lifetime from the Remain in Light album of 1980, which depicted Byrne in a suit manically dancing like a man possessed. He was at once a nerd at a school disco, and the kid nobody would mess with, not because he was tough but because he was weird: there was no telling how he would react to your approach. Burning Down the House in 1983, from the Speaking in Tongues album, had a playful video with the band being replaced, forcibly, with impostors. There was a little kid on guitar and lead vocals, and a little old lady on drums, for instance, but the whole "Are we allowed to laugh?" question was one that was definitely there in True Stories. 1985's Little Creatures album spawned two big hits, Road to Nowhere, whose video had the endlessly jogging Byrne in the corner as the panoply of life is played out in the main image, another classic merging of sound and visual, and And She Was, an animated representation of the song's titular lady (or parts of her, anyway) acting out the lyrics in what resembled a cut-out fashion. Again, the idea that life is a parade to be appreciated as it goes by before you was vivid. In 1988, two years after the True Stories experiment, the band released their final album Naked, and a more agitated mindset was displayed in the two videos to accompany the single. Blind was blatantly political, right at the end of Ronald Reagan's presidency, as if accusing the denizens of Virgil who would attend such a rally of their idiocy and acting against their self-interest. (Nothing But) Flowers was a deceptively milder song with its easygoing African rhythms, but listen to the lyrics and watch the video and you would see a song decrying a world heading for a doom of its own making, and the likes of Virgil returning to what's left of nature. Visuals continued to be highly important to Byrne as he staged his solo work, but True Stories represented his most purely dedicated endeavour to that; it may not be perfect, but it was more complex than it appeared, much like Talking Heads and Byrne himself.